Manly Waters Private Hospital has been providing expert and excellent nursing care to the Sydney Northern Beaches since 1972. Our rooms overlook spectacular Manly Cove, lending a peaceful and relaxing atmosphere to the hospital. It is only a five minute drive to the centre of Manly. 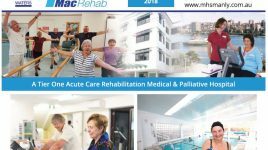 Manly Waters Private Hospital is part of Macquarie Health Corporation. Since 1973, Australian-owned, Macquarie Health Corporation has been helping Australians by providing high quality, cost effective healthcare in the communities we serve. Today, we are one of the nation’s leading provider of healthcare services that includes 12 Private Hospitals, Macquarie Medical Systems, MacRehab, Machealth eHealth solutions and Pen CS health informatics.